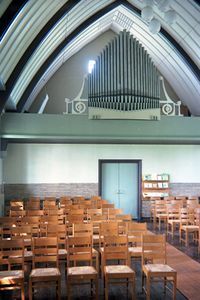 Interior of the Doopsgezinde Kerk, Gorredijk. Gorredijk, a town in the Dutch province of Friesland, seat of a Mennonite congregation, which already before 1700 had united with a congregation at Lippenhuizen, so that they are always referred to as the Gorredijk-Lippenhuizen congregation. The congregation had two meetinghouses, one in Gorredijk, and the other in Lippenhuizen. The latter was in use until September 1947 and was then sold. 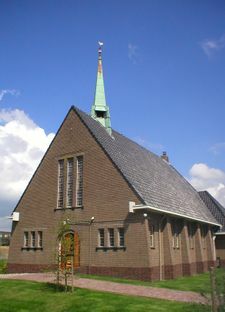 Gorredijk acquired a new church in 1940, dedicated 7 April. The origin and early history of the congregation is unknown. Very likely the Mennonite congregation at Gorredijk came into being during the 17th century. The Mennonite settlement at Lippenhuizen may have had its origin in the 16th century. The definite existence of a combined congregation of Gorredijk-Lippenhuizen in 1686 is proved by an entry in the church archives. But there are no records before 1739, with the exception of a few contracts of purchase. From 1739 the records have been preserved, and from 1748 the names of the preachers and members. In July 1711 a number of Swiss Mennonite refugees from the Emmental, Switzerland, a total of 18 persons, with the aid of the Dutch Mennonite Committee for Foreign Needs, were located near Gorredijk, but they did not feel at home here, and in May 1712 they moved to Kampen. But the Swiss Mennonites living here were Amish and the Gorredijk Swiss brethren were Mennonites (Rheydtvolk, i.e., followers of Hans Reist). The latter group in the fall of 1713 immigrated to the Palatinate. Not all the members lived in Gorredijk; some were scattered over several villages in the southeast of the province of Friesland. The members living in Oosterwolde organized a Mennonite circle (Kring) in 1949. The last untrained preachers of this congregation were Pieter Ymes, who in 1810 assumed the family name of van der Woude, a farmer at Lippenhuizen, serving 1782-1805, and Dirk Gerbens Visser 1806-1824. The congregation owed much to Eesge Ubeles Veenland and Pieter Ymes Veenland, who were treasurer (1868-1915) and president (1915- ) of the church board respectively. Church activities in the 1950s included a youth group, children's club, ladies' circles. Cate, Steven Blaupot ten. Geschiedenis der Doopsgezinden in Friesland. Leeuwarden: W. Eekhoff, 1839: 189, 200, 247, 254, 306. Doopsgezinde Bijdragen (1861): 133 f.; (1906): 95. Hege, Christian and Christian Neff. Mennonitisches Lexikon, 4 vols. Frankfurt & Weierhof: Hege; Karlsruhe: Schneider, 1913-1967: v. II, 137. Hoop Scheffer, Jacob Gijsbert de. Inventaris der Archiefstukken berustende bij de Vereenigde Doopsgezinde Gemeente to Amsterdam, 2 vols. Amsterdam: Uitgegeven en ten geschenke aangeboden door den Kerkeraad dier Gemeente, 1883-1884: v. I, Nos. 1868 f., 1872, 1881-1883. Reliwiki. "Gorredijk, Stationsweg 60 - Doopsgezinde Kerk." 1 January 2013. Web. 13 October 2014. http://reliwiki.nl/index.php/Gorredijk,_Stationsweg_60_-_Doopsgezinde_Kerk. Hulshoff, G. A. and Nanne van der Zijpp. "Gorredijk (Friesland, Netherlands)." Global Anabaptist Mennonite Encyclopedia Online. 1956. Web. 20 Apr 2019. http://gameo.org/index.php?title=Gorredijk_(Friesland,_Netherlands)&oldid=145271. Hulshoff, G. A. and Nanne van der Zijpp. (1956). Gorredijk (Friesland, Netherlands). Global Anabaptist Mennonite Encyclopedia Online. 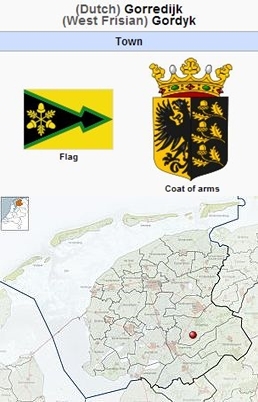 Retrieved 20 April 2019, from http://gameo.org/index.php?title=Gorredijk_(Friesland,_Netherlands)&oldid=145271. Adapted by permission of Herald Press, Harrisonburg, Virginia, from Mennonite Encyclopedia, Vol. 2, p. 543. All rights reserved.